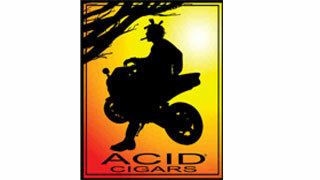 ACID cigars are made by Drew Estate, a company that's known for other iconic brands like Nica Rustica, Liga Privada No. 9, and Herrera Esteli. Experience a new blend and taste every time you buy an Acid cigar. Drew Estate allows you to experience vivid flavors by creating irresistible tobaccos blends that have been procured from exotic locations across the world. These handmade cigars are crafted with tobacco leaves that have been expertly cured in a unique manner. This organic process of fermentation involves soaking the tobacco leaves for over 3 months in red wine to achieve the desired flavor. The name of this brand was derived from New York-based artist, Scott Chester’s art studio, Arielle Chester Industrial Design (ACID). Acid cigar are handmade with the choicest tobaccos from the Dominican Republic, Nicaragua, Ecuador, Mexico and Honduras. Cigars in the Acid line are rolled in a variety of tobacco leaf wrappers procured from the USA, Cameroon, Indonesia, and Mexico. For instance, the Extra Ordinary Larry comes with a Connecticut broadleaf Maduro wrapper that offers the tantalizing taste of sweet spice. Another celebrated blend is the Kuba Deluxe Tubo which is rolled in Sumatra wrapper. This cigar is known for its smooth and mellow smoke. Explore a wide range of exceptional blends from this famous manufacturer. Explore a completely distinct taste like no other with these popular infused cigars! Filler: Dom. Rep., Ecuador, Honduras, Mexico, Nicaragua. You have to try these full bodied Nicaraguan Puros!